Meanwhile, in 2-quart saucepan, heat 1/2 cup whipping cream over medium-high heat until hot. Remove from heat; stir in 1 cup chocolate chips and the vanilla until smooth. Spread truffle filling in bottom of baked crust. Freeze 15 minutes. Meanwhile, in medium bowl, beat 1 cup whipping cream with electric mixer on high speed until stiff peaks form. Set aside. In another medium bowl, beat cream cheese, peanut butter and powdered sugar with electric mixer on medium speed until smooth; fold in whipped cream. Carefully spread over truffle filling. Refrigerate until set, about 2 hours. In small microwavable bowl, microwave 1/4 cup chocolate chips and the shortening uncovered on High 30 to 60 seconds, stirring every 15 seconds, until melted. 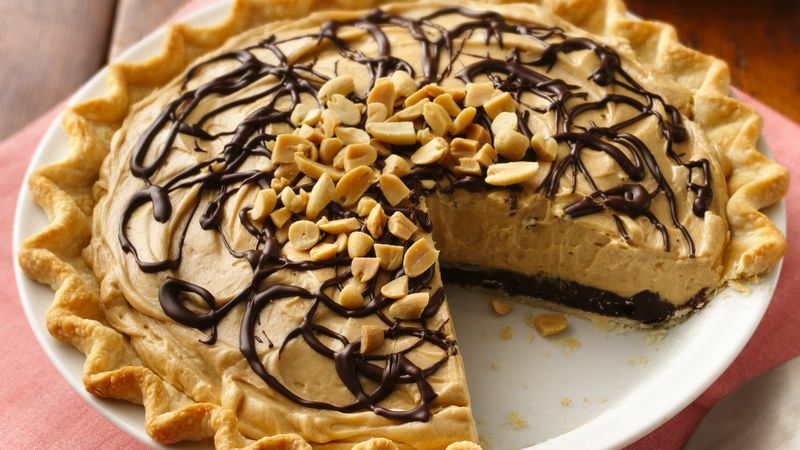 Drizzle chocolate over pie; sprinkle with peanuts. Cut into wedges to serve. Cover and refrigerate any remaining pie. Substitute crunchy peanut butter for the creamy peanut butter. Instead of making your own chocolate topping, use purchased chocolate topping instead.